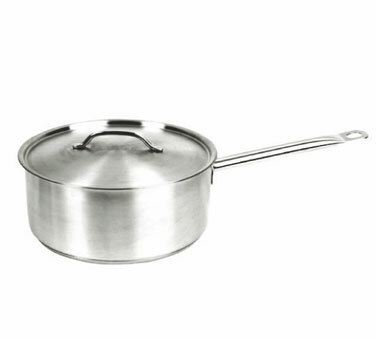 Thunder Induction Stainless Steel Sauce Pan- 3-1/2 quart, with cover. Extra-heavy duty aluminum-clad bottom allows for superior heat distribution. Can be used with induction cookers. 18/8 stainless steel, NSF. Attractive, versatile and sturdy. Commercial quality- not to be confused with pans you might find at a department store. Instant coupon! Use coupon code SAVE5FREE in the cart to save on this item. For an everyday-use pan in a professional kitchen or at home, you will not be disappointed with the quality and performance of this saucepan. For use at home, this is a perfect pan at a price and quality combination that is better than you'll find with more commonly-used household brand name cookware.